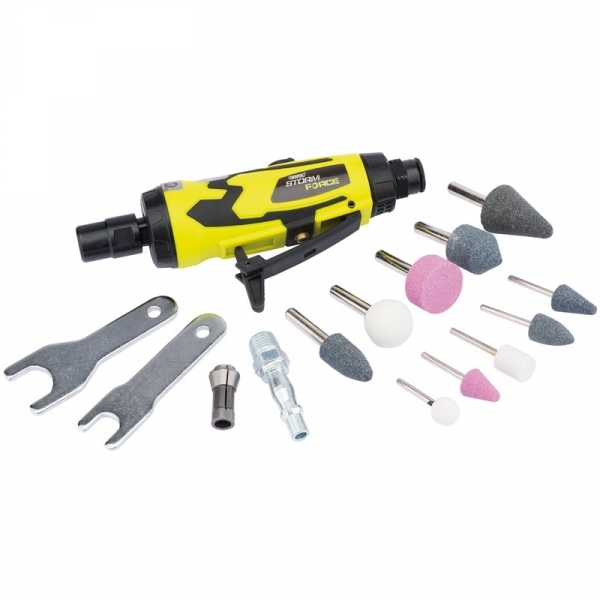 Draper Storm Force, low noise, low vibration soft-grip die grinder. Manufactured from lightweight composite plastics, delivering a low noise and low vibration user experience, ideal for use in professional workshops. The die grinders have added features including a variable speed control and rotating air inlet, which helps prevent the airlines from tangling. The composite body construction technique, provides a lightweight but rugged tool that reduces operator fatigue and the 'cold sink' effect. Supplied complete with two open-ended collet wrenches, accompanied with a blow mould storage case for convenience.